Nothing-at-all is perfectly contented to be invisible as long as he can do all of the same things his visible brothers can do. Until, one day, the brothers are adopted by a boy and a girl, who don’t take Nothing-at-all because they cannot see him. Nothing-at-all follows but soon loses them. A friendly Jackdaw, whose task it is to “carry home everything I see,” has helpfully found a Book of Magic which contains a spell to make something that is Nothingy into Somethingy. Needless to say, it works, and Nothing-at-all is able to rejoin his brothers. Wanda Gag’s illustrations have an undulating quality. The soft pastels (?) seem to move. I loved this book – and if it weren’t so long I would surely share it with the preschoolers! They’d have such fun with the “I’m busy/Getting dizzy” part! 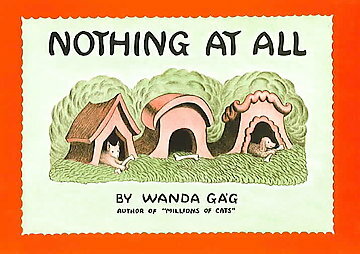 Nothing At All won the Caldecott Honor in 1942. The Caldecott Challenge 2012: Nerdcott! The end of last week I saw some kids’ librarian folks on twitter talking about “#nerdcott” and decided to check it out. I followed the twitter trail to this post by LibLaura5, describing a challenge she was setting to read ALL of the Caldecott winners (not just the medalists, but honors too!). Well, I love a good (do-able) challenge, so I decided that I’m in! I’m pretty knowledgeable about winners and honors from the last 15-or-so years (or at least the last 12 years that I’ve been working as a librarian), but the early years? Not so much. 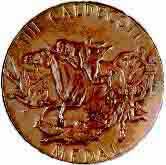 Did you know that the Caldecott Medal was first awarded in 1938? And that there are over 300 Caldecott medalists and honor books? I’d better get crackin’. The best thing about Laura’s challenge is that THERE ARE NO RULES. You don’t have to read the books in any particular order (which is good because some of them we have in the library, and some I will have to request from other libraries or ILL). You don’t have to set a time limit, if you don’t want to. So, my personal goal is to simply READ THEM ALL. Preferrably this year. I’ve already started from the bottom up; again, not in order, but that’s how I’m keeping track: I’m ordering the books from the earlier years first and reading them as they come in. I read Andy and the Lion and Barkis this morning, and have Wee Gillis, Abraham Lincoln, and Snow White and the Seven Dwarves on my desk. I probably won’t review all of them here as I really only like to write reviews of books that a) I love and b) feel inspired to write about. Wanna challenge yourself? Get the full list of Caldecott Medal and Honor books. If you have a blog and want to indicate your participation, Laura has made an icon available. And remember, if you tweet, don’t forget to add the hashtag #nerdcott so we can all enjoy each other’s company! I did my best to live-tweet the winners, but my ipod touch died right before the thing started and I couldn’t type fast enough on my phone. So I just gave the highlights. The full list can be found on ALA’s website here. I’m generally pretty bad at predicting the winners (except for last year), and I’ll admit that most of the Newbery winners were completely off my radar this year. But they all look great! Congratulations to the winners! Holy guacamole, I picked ’em! My picks for Newbery and Caldecott medals WON! That NEVER happens! Plus, I’ve actually read a bunch of these! Whoa! I think I’ll go buy a lottery ticket or something! Scanlon, Liz. All the World, illustrated by Marla Frazee. Sidman, Joyce. Red Sings from Treetops: A Year in Colors, illustrated by Pamela Zagarenski. Hoose, Phillip. Claudette Colvin, Twice Toward Justice. Lin, Grace. Where the Mountain Meets the Moon. Barnes, John. Tales of the Madman Underground: An Historical Romance, 1973. You can see the full list of the awards, including the Coretta Scott King, Pura Belpre, and Sibert here. Newbery Medal: Stead, Rebecca. When You Reach Me. I would have LOVED this book as a girl. As an adult, I loved it. Miranda, a New York City 6th grader, relates certain incidents in her life after being asked to do so in four strange anonymous notes. Who’s sent the notes, why do they want her to write a letter, and why does this person know things about Miranda’s life, her friends, and the future? The story is like nothing I’ve ever read before, and yet, I felt something warm and familiar about the characters and story. Confusing, heartwarming, realistic and fantastical all at the same time. Read it, and see if you can figure it out. Caldecott Medal: Pinkney, Jerry. The Lion and the Mouse. In a nearly wordless picture book, Pinkney retells the Aesop’s fable about a mouse who returns a lion’s favor when the lion finds himself trapped in a net. The gorgeous watercolor illustrations give us all the information we need without words, and as the Caldecott medal is all about the illustrations, this one should be a shoe-in for at least an honor. It’s simply a beautiful book, one of those that you’d buy for your kids and hang on to for years, even after they’ve long grown up. It’s a share-with-your-grandkids kind of book (which I will share with mine, if I ever have any). Oh, and as there are so few words, it’s a great one for a child to “read” to an adult (hello, narrative skills!). I’m often completely off base, nor have I read all of the books that are getting awards buzz, so by no means should you go to Vegas put any wagers on my picks. This is just what I liked best. What are your picks? I didn’t do the Printz because I haven’t read enough YA (I’m still waiting on my copy of Catching Fire), but I’d be interested to hear what you think!